This digital microscope camera is a completely portable and independent solution to digital microscopy outdoors and in confined and inaccessible places. A 3in flip-out colour LCD screen provides real time viewing and images and video can be saved onto a MicroSD card (up to 16GB – not supplied). The high capacity 3.7V 800mAh Li-ion battery means that there is up to 4 hours working time. The image sensor is a high quality 5.0MP CMOS and the unit has a 20x to 200x and 500x magnification range. 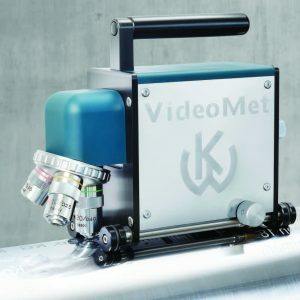 There is software provided that, when the camera is connected to a computer or when the images/video is downloaded, can provide accurate measurements of distance, area, angles and radii to an accuracy of 1µm. The supplied swivelling metal stand allows the camera to be set up to take stable focussed images/video for precise digital microscopy.